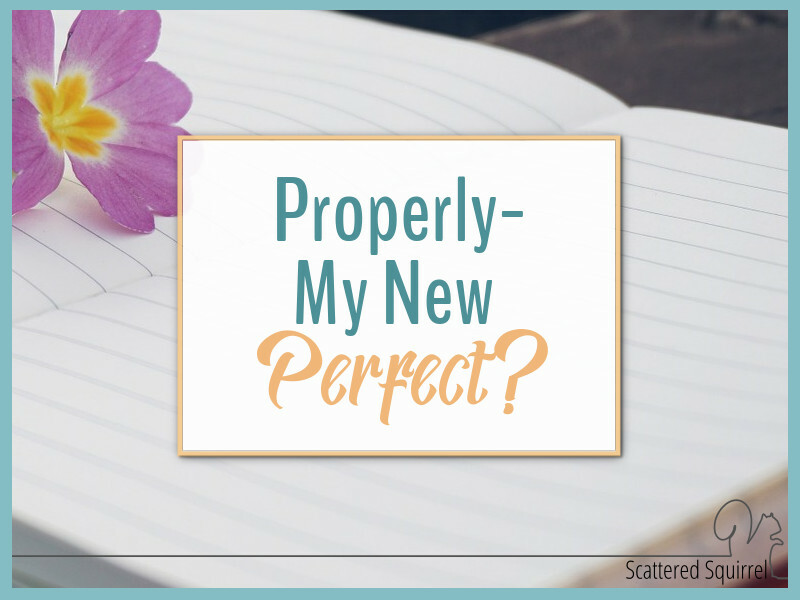 Properly – My New Perfect? Do you ever find yourself feeling like you reached a point in life and you’re not sure how you got there? You’re pretty sure you don’t want to be there anymore, but you don’t know how to get out? I have a confession to make – I’m stuck in that rut right now. I feel as though I’m being pulled in too many directions. There are too many demands on my time and not enough time in the day to meet them all. I’m caught in a vicious cycle that I created myself when I wasn’t paying attention. I wasn’t diligent in guarding my time and my routines. I let life changes set me adrift and let chance and circumstance steer the rudder. The good news is, I think I’ve figured out what’s at the root of the problem. Last October, during the From Scattered to Sane series I talked a little bit about this state of mind. I talked about the tools and tricks I use to help pull myself from the chaos. I’m very thankful for those tools. My three daily and weekly tasks have helped to keep me sane and keep things from totally falling apart, but like I said in the series, they are meant to be a foundation. They are meant to be survival mode. They are not meant to be the only things keeping us moving forward. I haven’t done very well at taking my own advice. One of the hardest lessons for me to learn in the early days of journey to figuring out my scatter-brained approach to everyday living was letting go of the need for things to be perfect. Perfectionism ran rampant within me, and I fell into the trap of “if I can’t do it perfectly then why bother?” I wrote a post last year titled “There is No Such Thing as Perfect” because learning that lesson played such a huge role in helping me move forward and find my calm in the chaos. I used to think I’d done a good job of letting go of perfect. Lately, though, I’m noticing that I didn’t let go of it. I’m not sure when or how, but somewhere along the way I replaced the word perfect with properly. I’ll use vacuuming as a good example. I didn’t have time on Vacuuming day to do the vacuuming to my usual standards, so I just didn’t do it – like at all! I could have done a quick vacuum of the main areas, or I could have done a thorough vacuuming of a few rooms, and it would have better than none at all, but oh no – I didn’t have time to do it all ‘properly’ so I didn’t do it at all. Ugh! Now the vacuuming will have to happen on the weekend, or take time away from something else, in order to get done. That’s just one example. I did the same thing with the dusting. It’s pollen season,which means that I really should dust twice a week, but I didn’t have time to do it properly earlier this week and now it’s going to take twice as long to get it done later on today. If I’d just taken the time to quickly wipe down all the surfaces that would have been so much better than not doing it at all. In addition to making properly my new perfect, part of the reason I’ve been stuck in this rut is that I haven’t allowed myself time to explore. I’ve trapped myself into sticking to what isn’t working, in the hopes that I can eventually make it work. I’ve broken my own golden rule of making my systems and routines work with me and have been hard at work working for them. This was from the From Scattered to Sane series, Day 10. It’s a printable, so please feel free to print it and put it in your planner, journal, or wherever works best for you. Not have all the answers. Take time out for me to figure things out on the inside. Take time to experiment and see what works and what doesn’t. I’m taking the time to explore and seek out those new ideas. 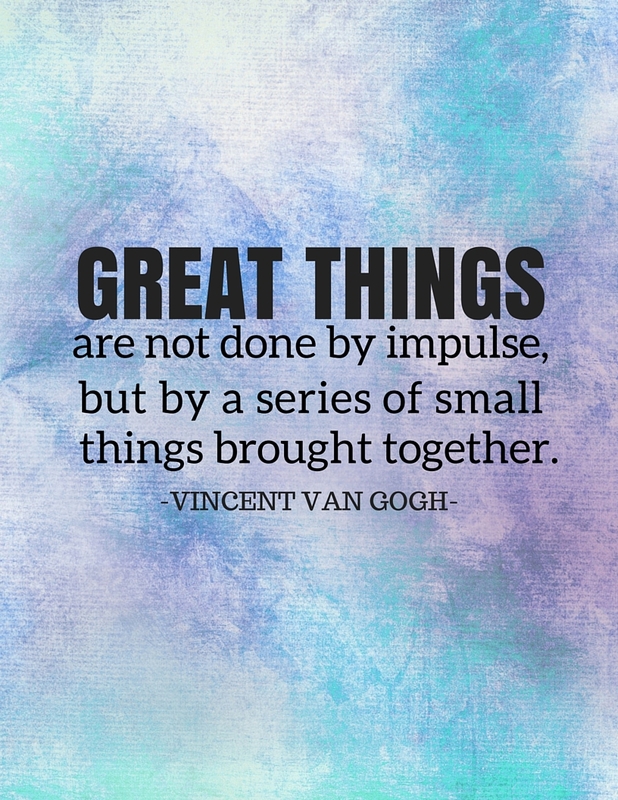 To take small steps forward and not worry about leaps and bounds. Most importantly, I’m working with myself not against myself. I know from experience that my home is usually a direct reflection of what I feel inside. Taking care of me and clearing the clutter from head, generally helps me take better care of our home. And, strangely enough, it works the other way around. I don’t have to spend my whole day focusing on those two things, but I’m setting aside dedicated time every single day to pursue ideas for making things work better for me. I’m going to keep reminding myself that half-way done is better than not at all. Using my vacuum example from above – even if I just did a quick vacuum of all the rooms without out moving the furniture I usually move and not doing the edges, my vacuum catch up time this weekend would’ve much short because I would only need to do the spots I missed. And maybe give the rest of the space another quick go over. I’m also giving myself permission to chase the shiny, new things. Life itself is full of detours. Life as a scatter-brain seems to be full of detours from the detours. It can be a snarling snaking path that leads us around in circles. Life experience has taught me that sometimes those detours are necessary to get to where we want to be. Seeking out new ideas, trying new things and seeing what sticks is part of shedding what doesn’t. The new shiny things that many would classify as a waste of time are often the exact things we need. Even if they don’t offer us a solution to our current dilemma, they often show us what won’t work for us, and that is just as important as finding what does. Speaking for myself, finding what doesn’t work seems to help me focus better when I stumble upon what does. My mind settles and I’m not as full of ‘what ifs’ because I’ve already tried them. They lose their shiny appeal and the power to distract. Taking detours allows the part of me that craves the new to explore and expand and be happy. And as a result is allows the part of me that craves routine and structure to find contentment in the end result. I’m hoping that by allowing myself this freedom, and reminding myself that getting something done halfway is better than waiting for the right time to do it ‘properly’ will help me find my rhythm again. Or at least, help me tame the chaos a little. Do you ever find yourself in a rut? What do you do to break out of it? Previous Post: « 2017 Yearly Calendar Printables are Here!!!! 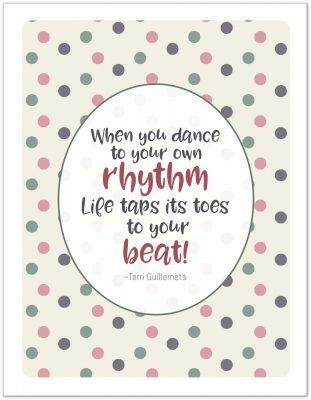 I am really glad I “stumbled” upon your blog and planner printables today. I feel like I’ve found THE person who understands how my mind works. LOL. 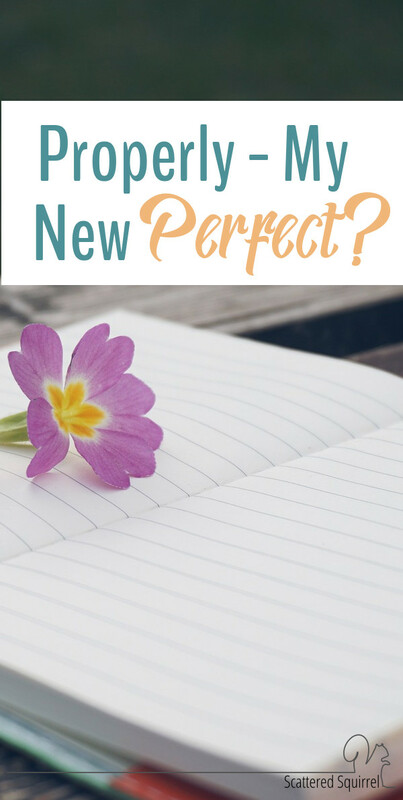 I totally understand the “perfection” trap and my search for a planner that works for me is due to how easily I am distracted, and then find I haven’t accomplished what I had intended to. Count me in as a “follower” now, and thank you so much for everything that you share! Hi Linda, I’m happy you found us too. Welcome to the scatter-brained fun! Being easily distracted and not being able to find the right planner, are the two main reasons I started making my own printables so I totally understand where you’re coming from. I hope you find a few things here to help you on your planner journey. I am so guilty of this! Thanks for this post…it never really occurred to me that I do this all the time.